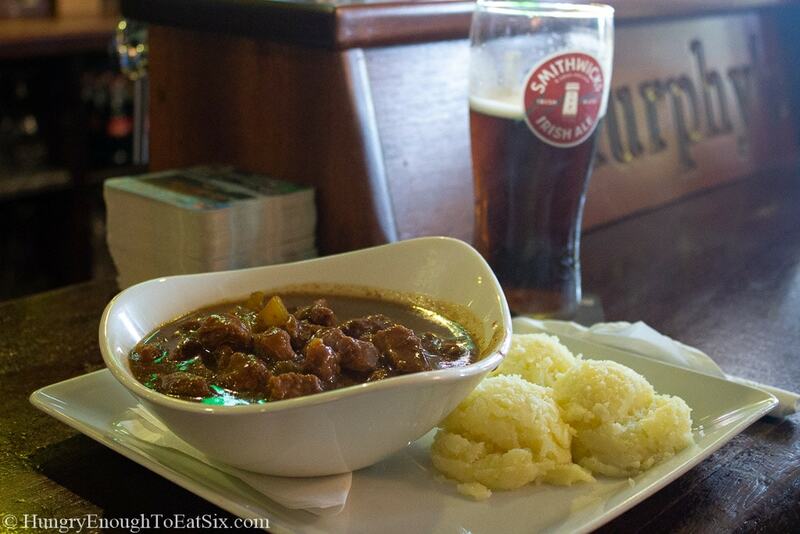 Our next stop in Ireland? 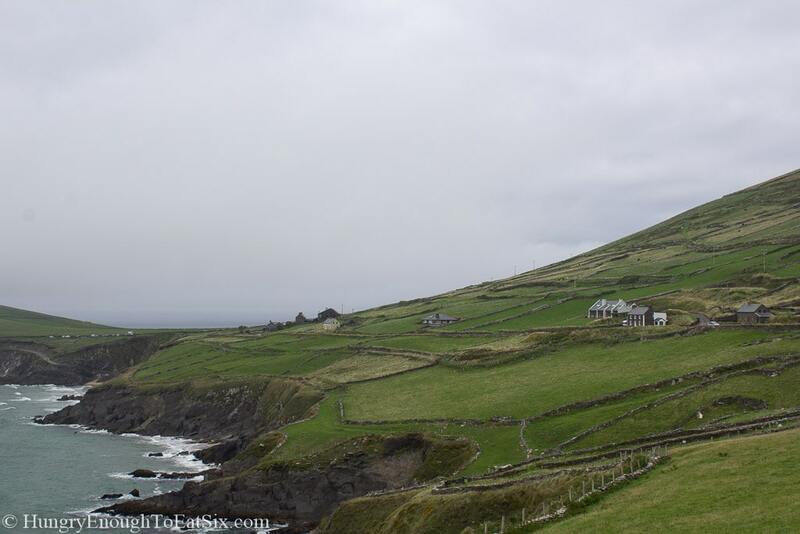 County Kerry for a B&B in Castlemaine (Caisleán na Mainge) and sights in Dingle (Daingean Uí Chúis). 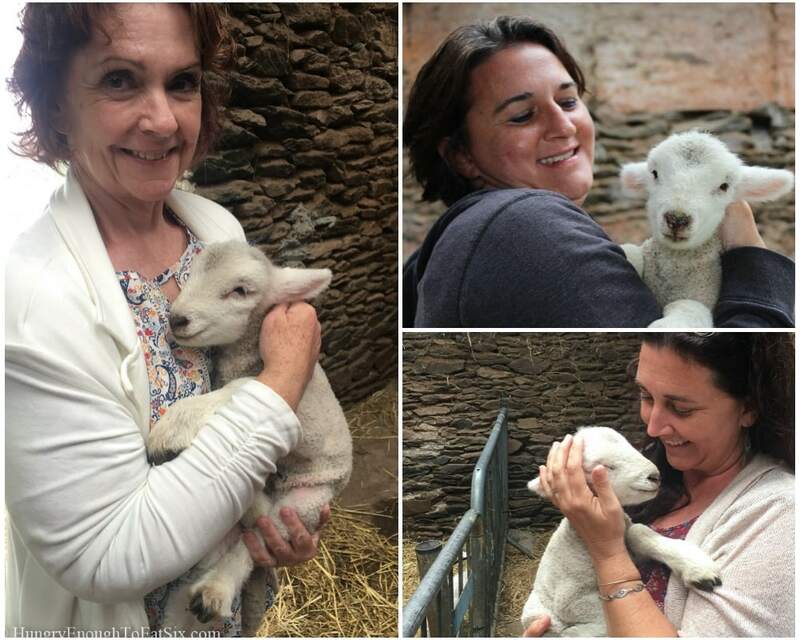 (Including holding a baby lamb!) 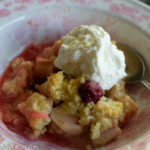 And my recipe for you here is an Irresistible Apple Blackberry Crumble. 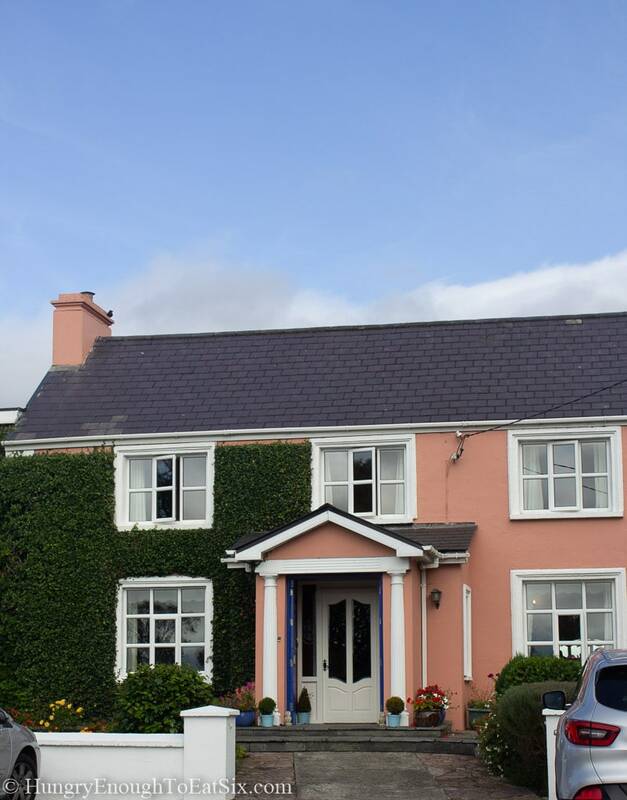 After driving all evening from Dublin we arrived pretty late at night at our next B&B: Murphy’s Farmhouse in Castlemaine. Even in the dark I could see that it was going to be a charming place to stay! 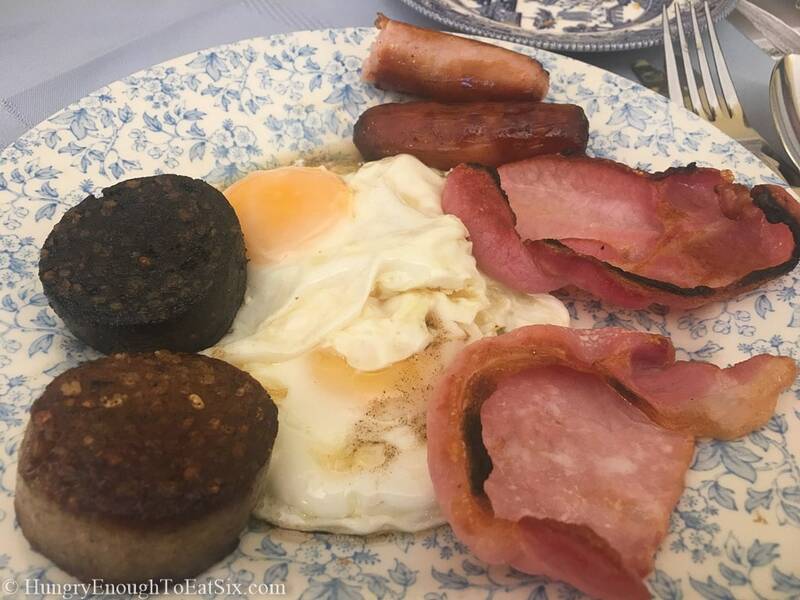 We were up the next morning in time for breakfast, and there I had my first big Irish breakfast, complete with sausages, fried eggs, black and white pudding and rashers of bacon. 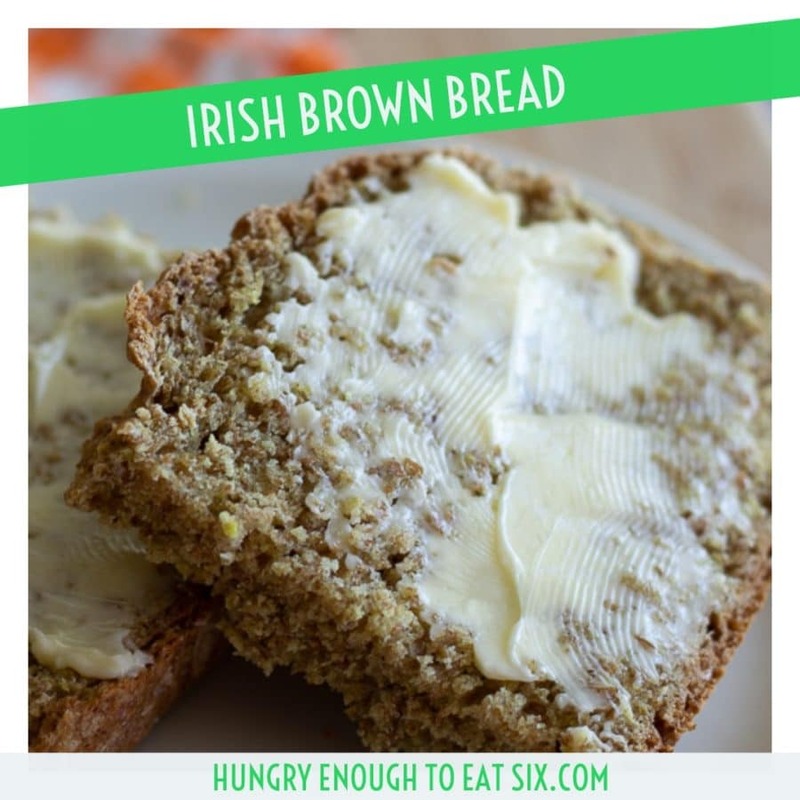 Not to mention toast, brown bread, juice, scones, and a few hot cups of Americano. I don’t normally have a breakfast this big but this one was glorious! 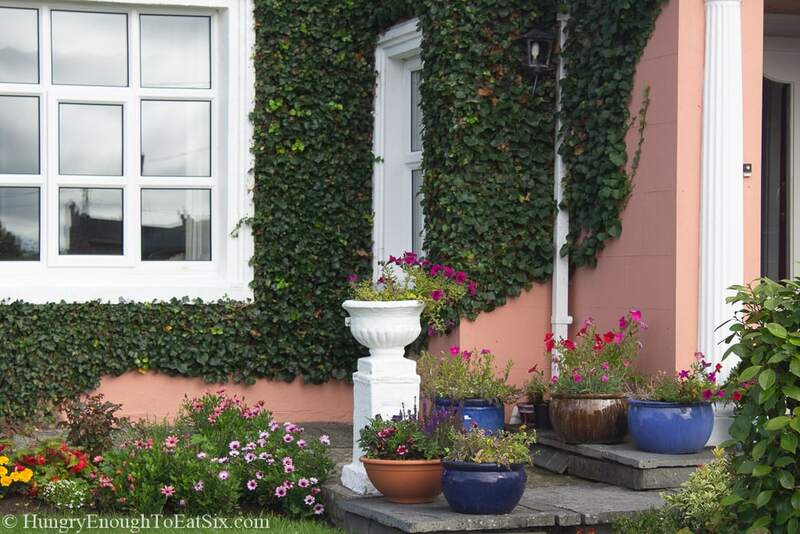 In the light of morning I could really take in the beauty of Murphy’s, the climbing vines and bright pots of flowers, and the fields around the house. Not to mention the charm inside as well! 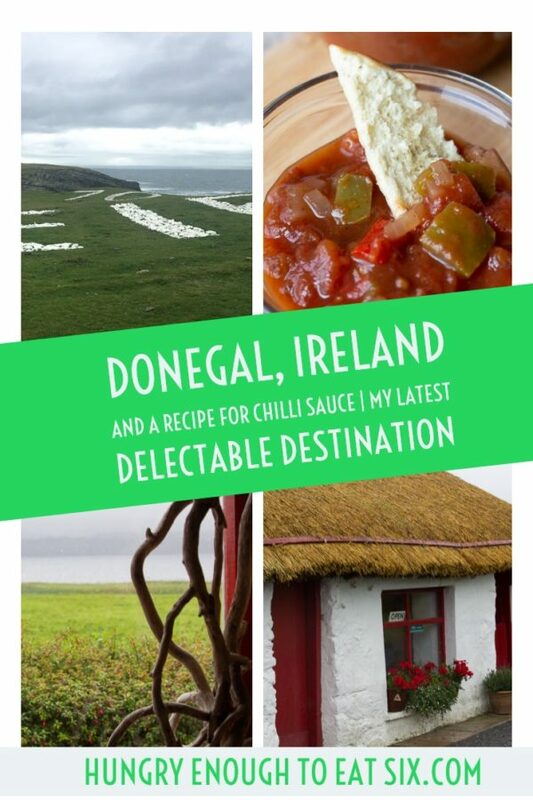 That day we headed to Dingle to explore the shops and the peninsula, and we weren’t sure what else! 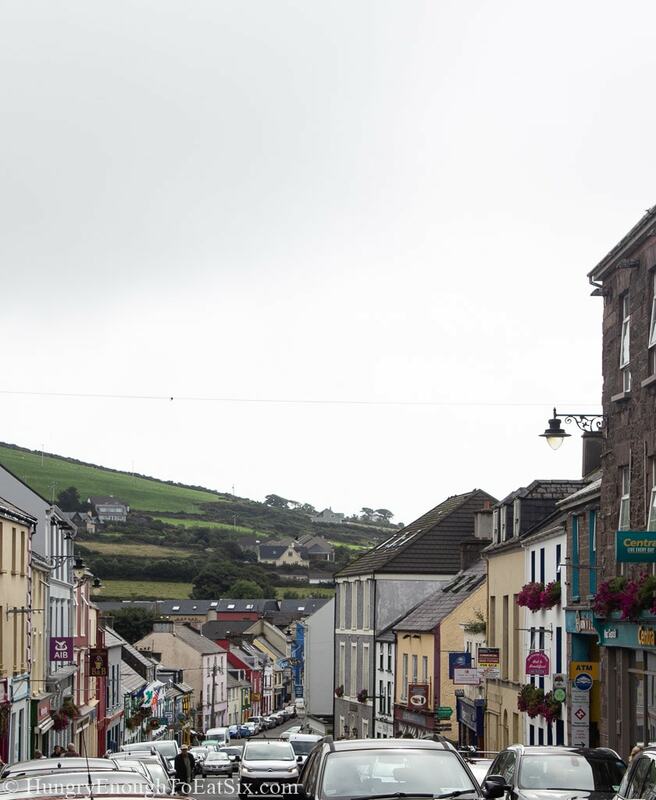 The streets of Dingle are tiny and winding, filled with shops and cafés. 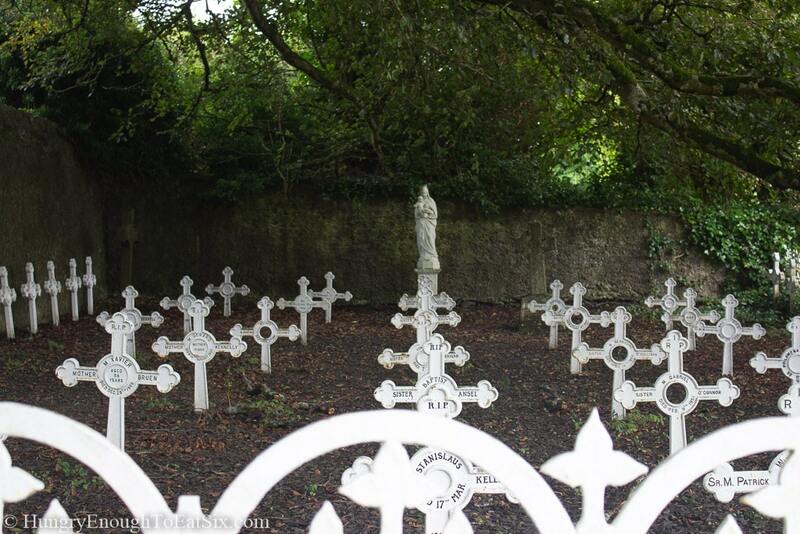 As we walked around we also saw the grounds of St. Mary’s Church which included this nun’s graveyard shaded by an enormous twisted tree, the white crosses gleaming in the shadows. 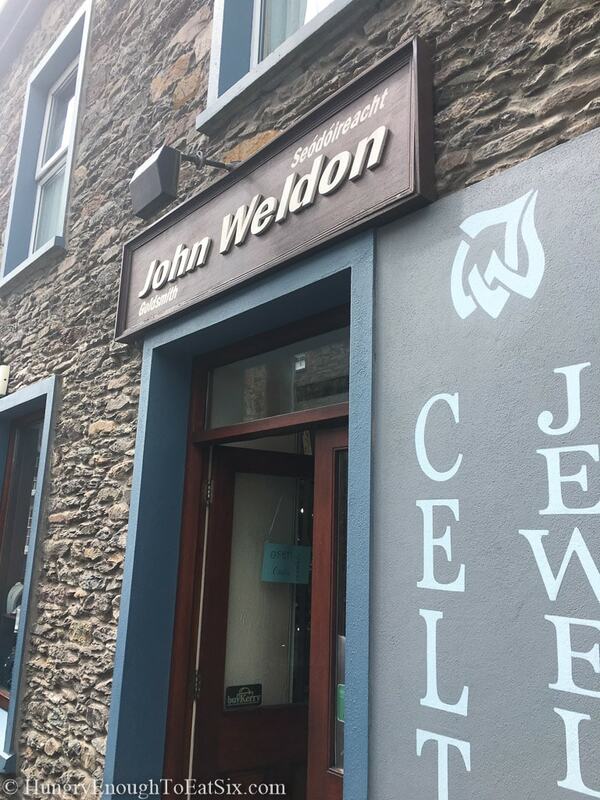 One of the stops my sister was eager to make was at John Weldon’s Celtic Jewellry Shop. We all have pieces by John Weldon that mom bought back on her first trip to Ireland, and my sister had others as well that she bought for herself. She brought one of these with her: a ring that was badly bent. John Weldon was in the store that day and repaired it for her on the spot. His jewelry is gorgeous and unique, and we all picked up a few extra pieces! 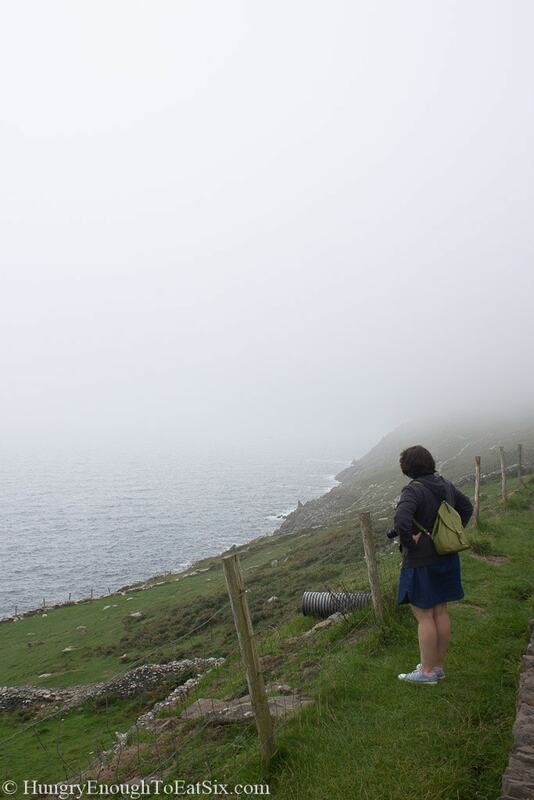 Our wanderings took us down towards Dingle Harbour, and there we stopped in at Murphy’s Pub and B&B for some lunch. 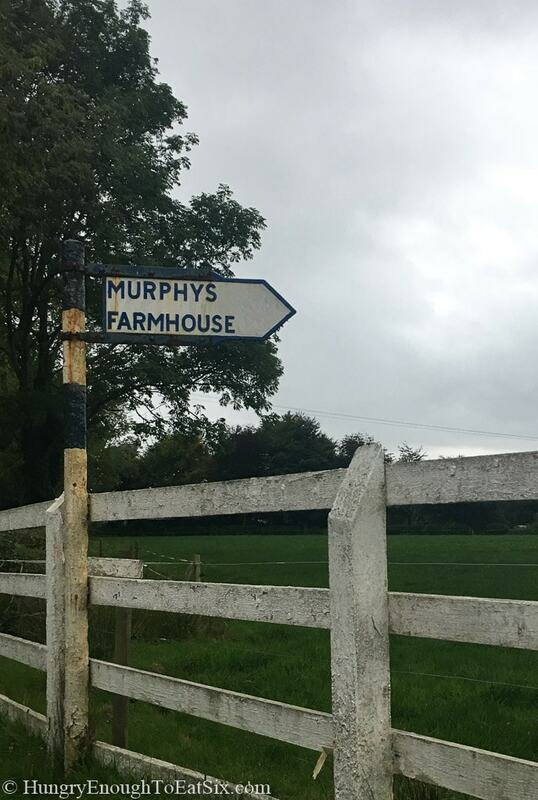 (How fitting, after staying the night at Murphy’s Farmhouse!) It was pretty busy but we were able to sit at the bar, and that was perfect! 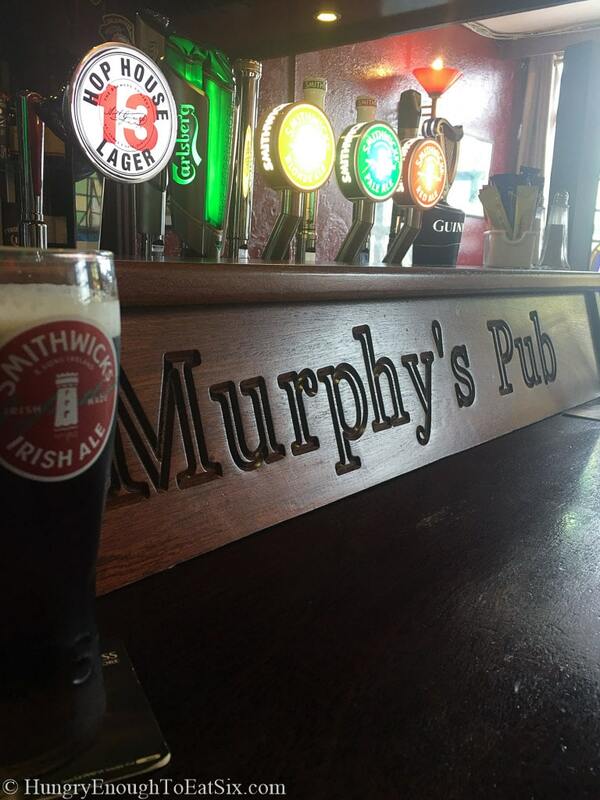 My sister and I tried some brews from Smithwick’s, a Kilkenny-based brewery. (And some hot tea for mom. She found that her preferred iced tea is a rare drink in Ireland!) Their website touts “The red one, the blonde one and the pale one.” My sister tried the pale one and I had the red. They were smooth and perfect to sip on while chatting with our waitress, and taking in the stream of people coming in and out of the pub. Mary, the owner at Murphy’s Farmhouse had suggested that we check out the Slea Head drive while in Dingle, so after lunch and a walk along the pier, we headed that way. 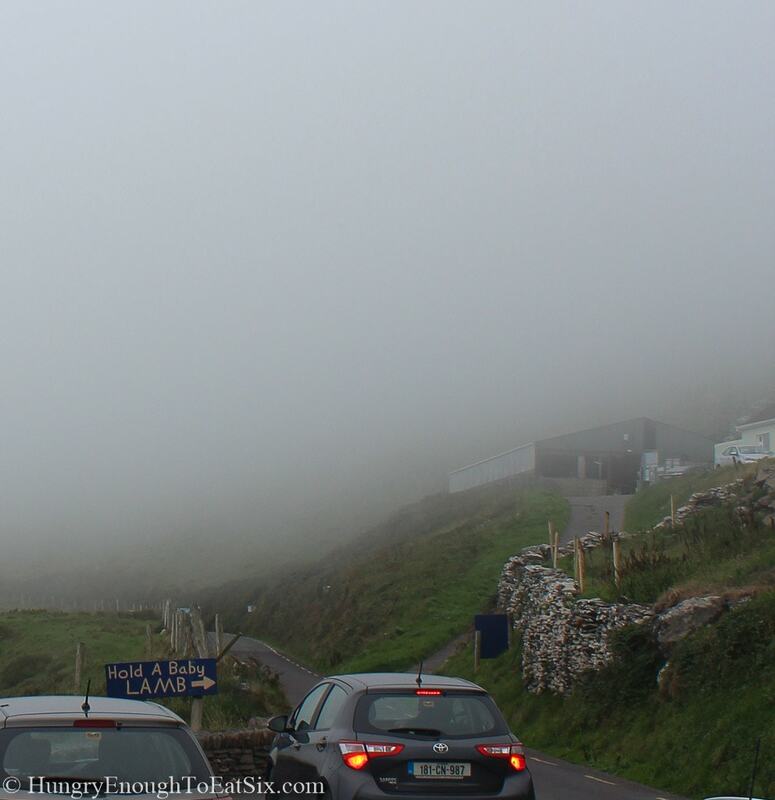 Slea Head drive is a loop around the coast that begins and ends in Dingle. The twisting road slopes down to the ocean on one side with land and rock rising sharply on the other. 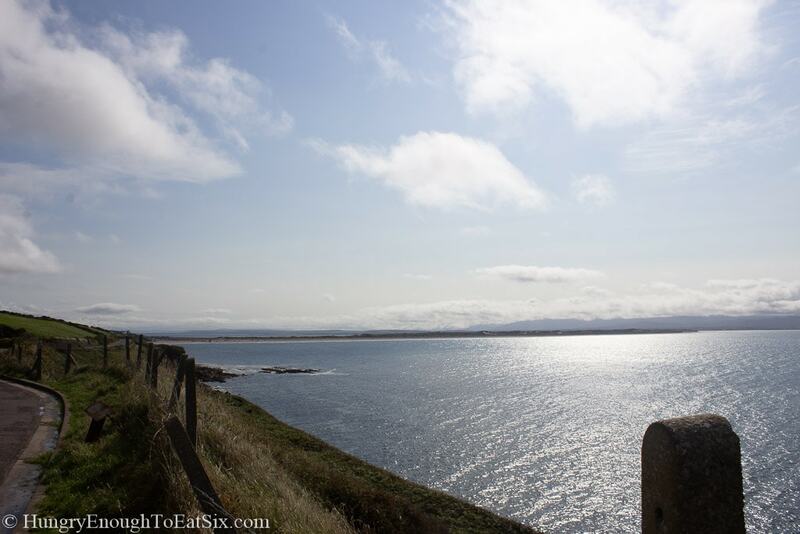 It is a beautiful drive, and there are plenty of pull-off spots to grab some photos! One spot on the drive that caught our attention was the Beehive Huts, which are ancient stone dwellings known as clocháns. Signs along the drive advertised “Iron Age Stone Huts” and also “Hold a Baby Lamb” – and I have to admit that this was the sign that made us pull over! 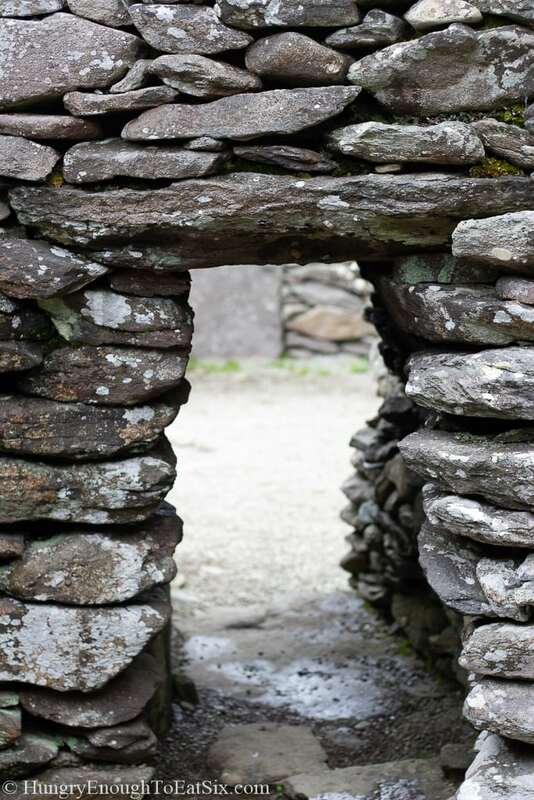 The stone huts and walls around them were intriguing, simple in appearance yet meticulously constructed. And the awe I felt in Dublin looking at the Book of Kells I felt again here, of how something this fragile could have seen so many generations of humans come and go and still be standing. 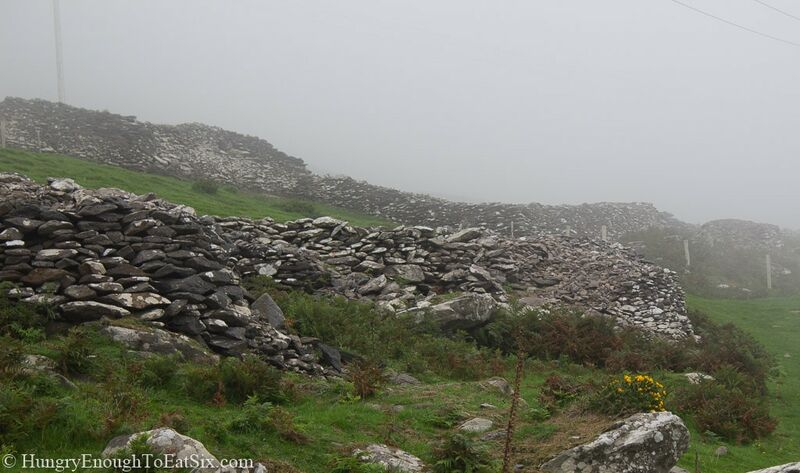 This spot on the hillside, the rocky fields around the huts had a stark quality that was ominous, almost unnerving, and amplified by the thick fog hanging low all around. 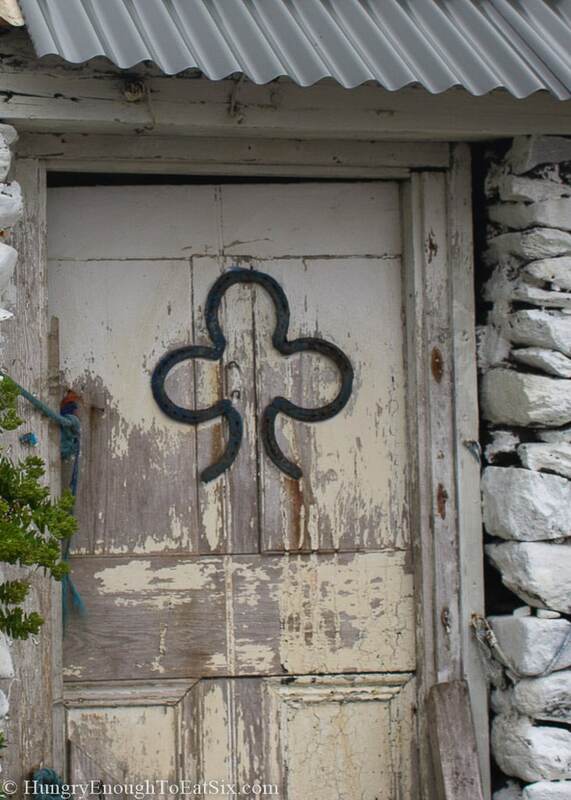 The only colors in the landscape were the dark green of the grass and the gray in stones of the huts and low walls, in the sky above us, and in the ocean below. On a sunny day the view must be spectacular with jewel-like hues everywhere, but that day it felt like the fog was pressing in all around us. But then we got to hold the lamb! This lamb… sweet, soft, and only 3 days old. It was the sweetest, coziest feeling in the world! 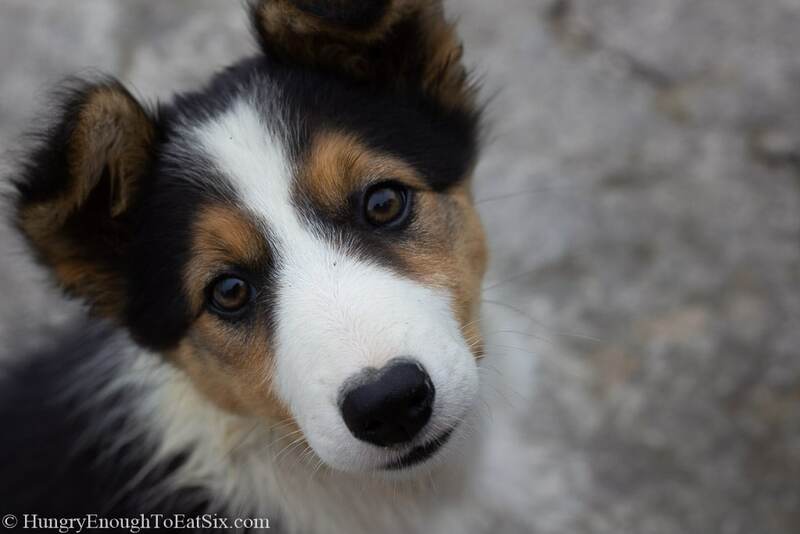 And the farmer’s little puppy was pretty cute too! To be clear, I am not knocking the fact that we had a gray day for our drive. 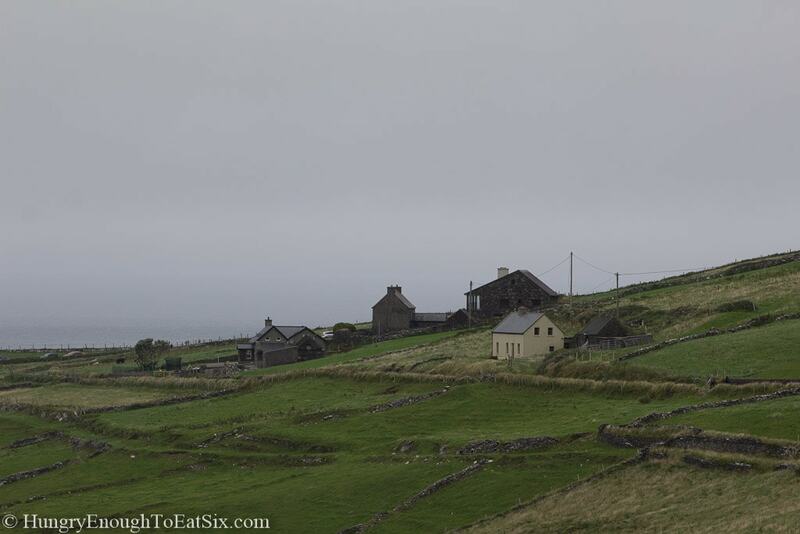 In the spots of Slea Head where the fog thinned away, the scenery of green fields with stone walls threaded throughout and houses studded here and there was gorgeous against the neutral backdrop. 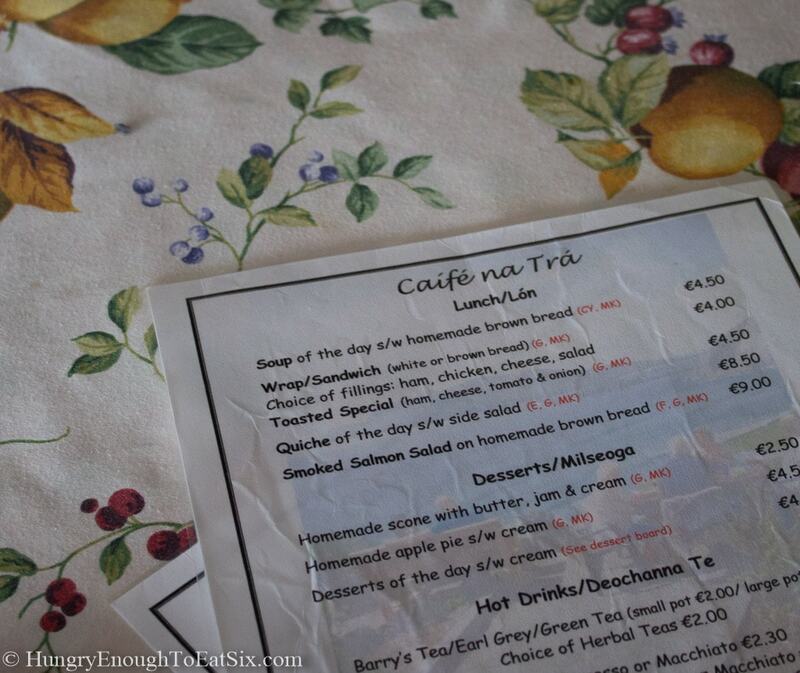 We didn’t drive the whole length of the Slea Head loop but we did make it far enough to stop in at the Caifé na Trá, tucked into the side of a cliff with the ocean pounding below. 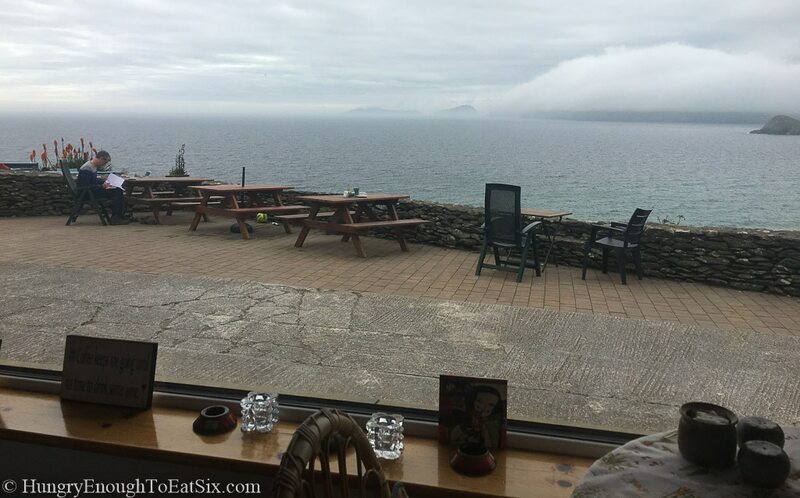 I have never seen a café with a view like this! 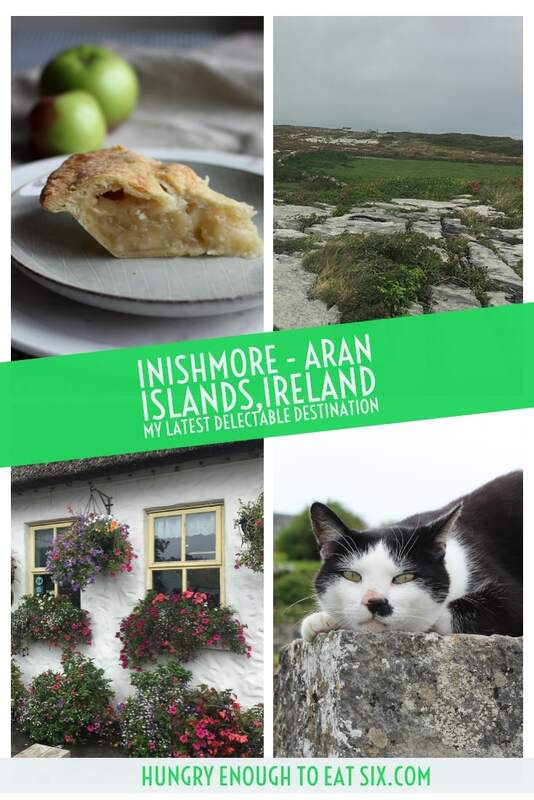 We took some of their treats with us in the car: hot tea and Americanos, brown bread and butter for mom, and a gooey-rich brownie for me that also happened to be gluten-free! But my sister’s treat was the best: a homemade apple blackberry crumble. 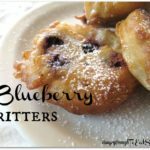 The fruits were a perfect sweet-tart combination and this dessert was the inspiration for my recipe today! 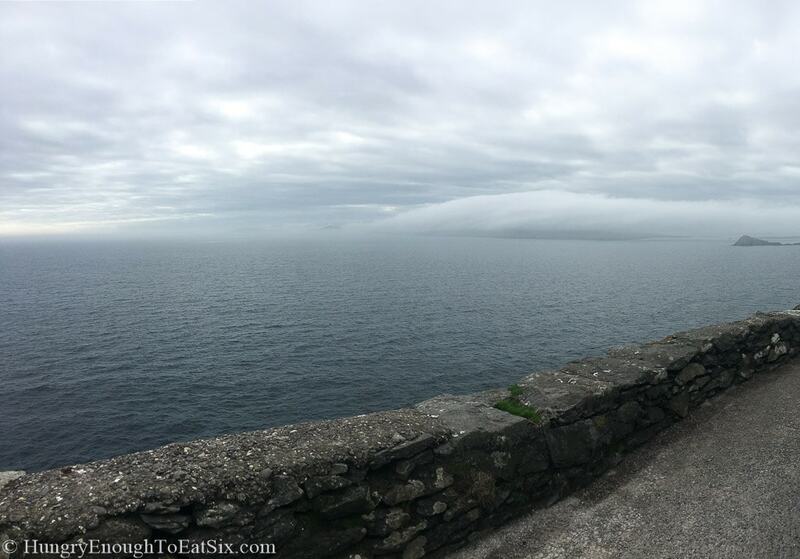 As we waited for our food I noticed this wall of clouds rolling in. Seeing the storms come in from here must be exhilarating, and at times frightening! 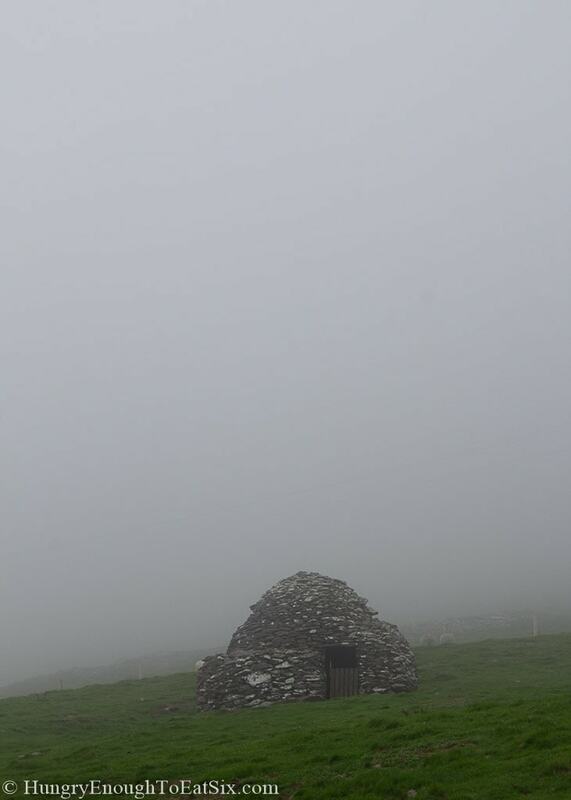 Somewhere out in that fog is Skellig Michael, a steep, rocky island dotted with stone huts like those we had seen while holding the lamb. 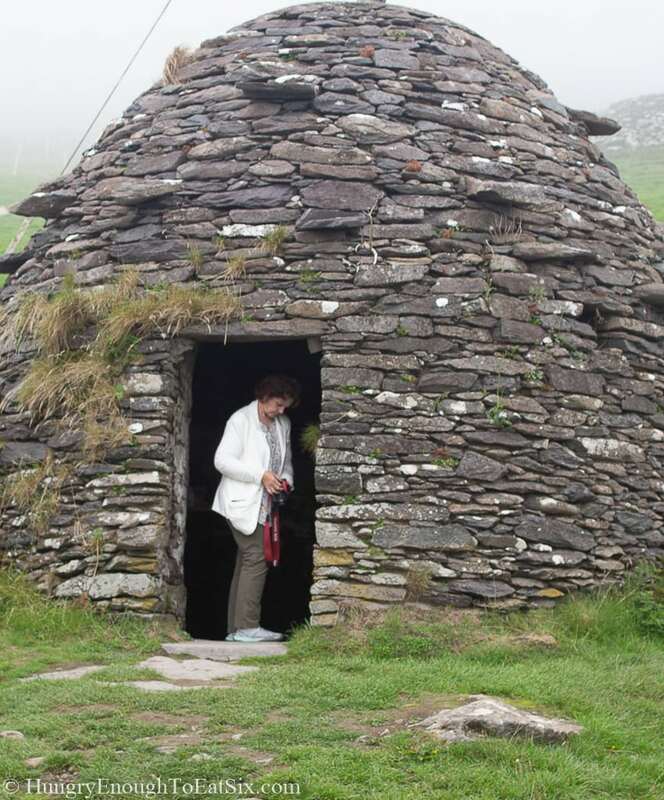 Skellig Michael was the location used in Star Wars: The Last Jedi, where Luke has been living in exile and where he agrees to train Rey. 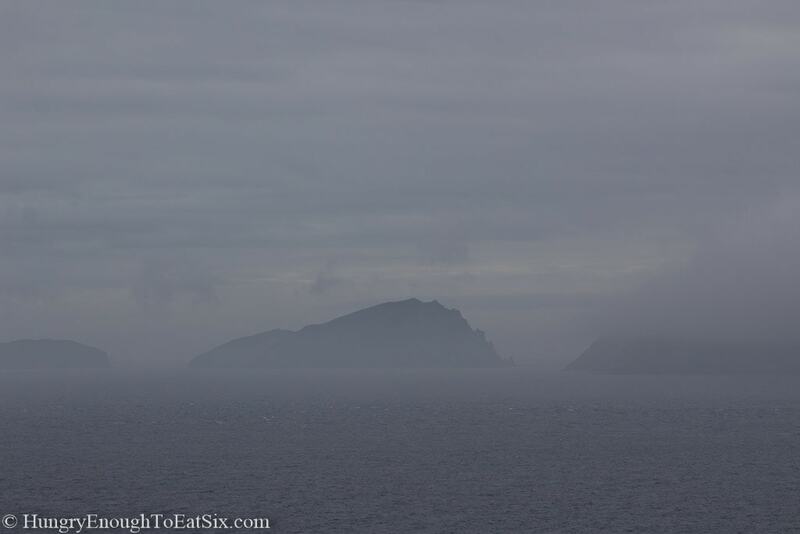 We noticed in Dingle that the souvenir shops happily played up this Star Wars connection, and we found some fun unofficial Star Wars/Dingle themed t-shirts (picture puffins in Stormtrooper helmets) to bring home! 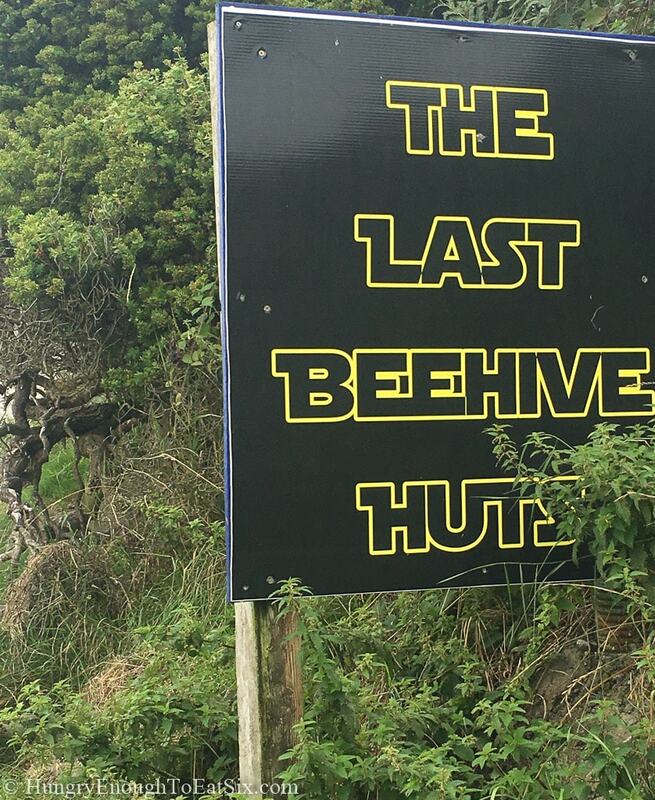 It also explains this sign for the Beehive Huts written in Star Wars font. It had been difficult at all of our stops to not have more time to explore, as they were all so unique with so much to see. 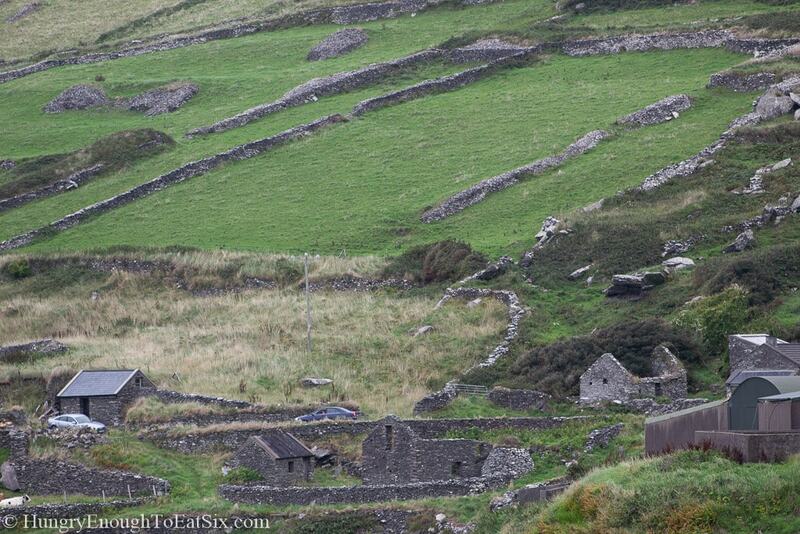 And the same was true in Dingle – we could have continued exploring for days. But at least that day we had had more time than in previous stops, since we were headed back to Murphy’s Farmhouse to stay a second night! 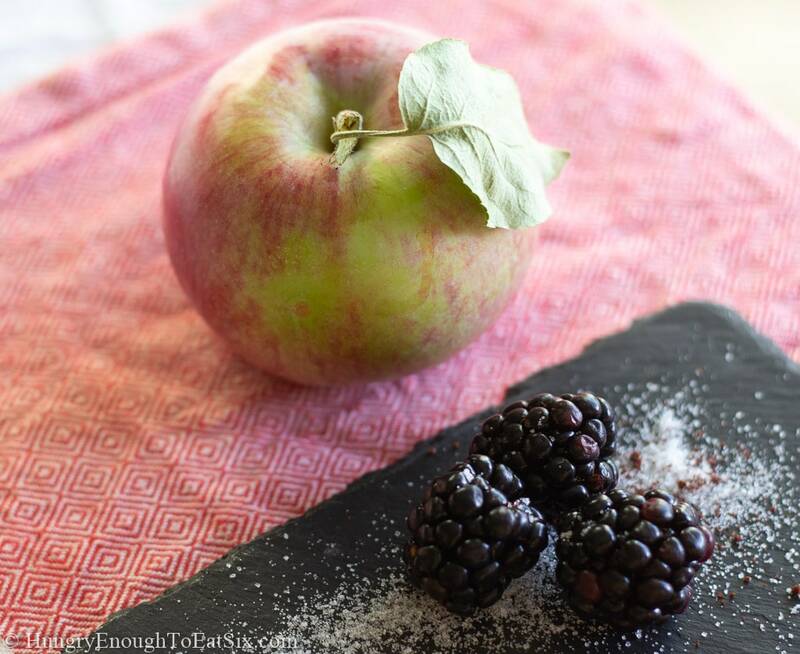 Inspired by the delicious dessert from Caifé na Trá, I created this Apple Blackberry Crumble, with juicy blackberries and freshly-picked McIntosh apples. 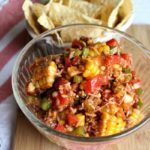 The recipe is below! 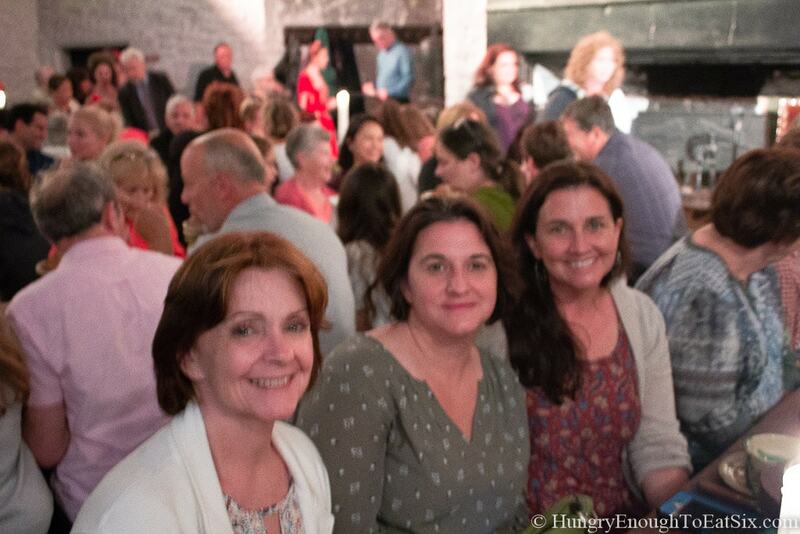 Next post: dinner in Castlemaine and a day in Limerick. 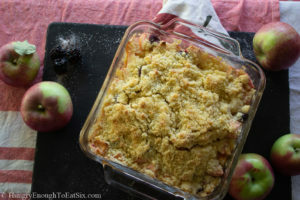 A homey and fruity dessert, this Apple-Blackberry Crumble is sliced apples and fresh blackberries tossed together and topped with a simple, sweet crumble! Preheat the oven to 400° F. Have an 8-inch x 8-inch baking pan ready. Pour the lemon juice into a large bowl. 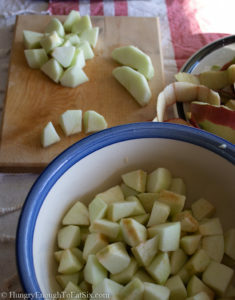 Peel, core, and slice the apples into 1-inch chunks. (If you’re using an apple slicer like I did, cut each wedge into 3 pieces.) Place the apple chunks in the bowl and after each addition toss them in the lemon juice to keep them from turning brown. Add 2 tablespoons of the sugar to the bowl, along with the ground cloves and the pinch of salt and toss the apples to coat them in the sugar and spices. Slice the blackberries in half (if they are large – if they’re tiny you can skip this.) 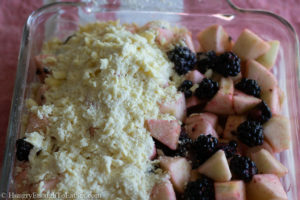 Add the sliced blackberries to the apples and mix them in. Use 1 or 2 teaspoons of the butter to grease the bottom and sides of the baking pan. 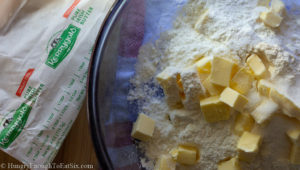 Slice the remaining butter into small pieces and place them in a medium bowl. Add the remaining sugar and the flour to the bowl. 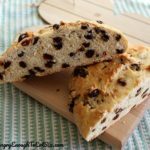 Use a pastry blender or a fork to cut the butter into the flour and to combine everything together – it is ready when the mixture looks shaggy and most of the loose flour is gathered up by the butter. 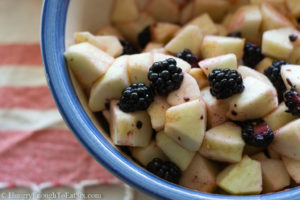 Pour the apples and blackberries into the prepared pan, and spread them into an even layer. Sprinkle the flour-butter-sugar mixture evenly over the top of the fruit. Put the pan in the oven and bake it for 30-35 minutes. 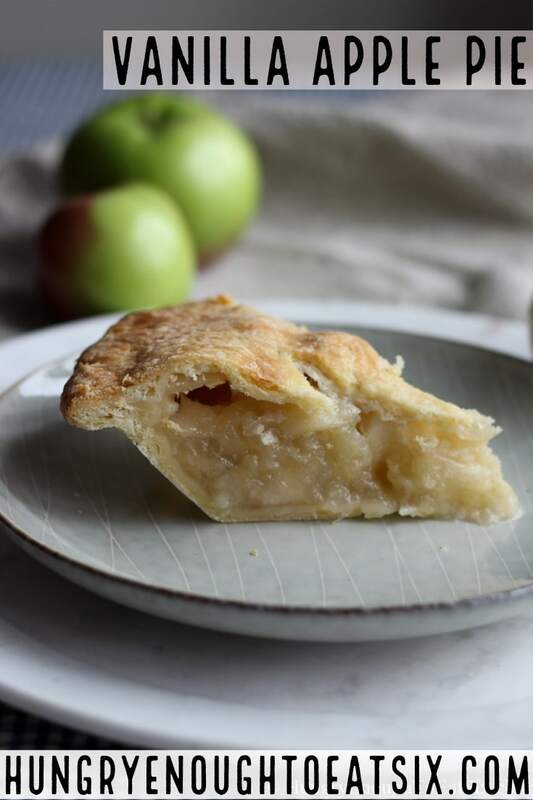 The apples should be soft and the crumble topping lightly browned in places. Remove the pan from the oven to a cooling rack and allow it to rest for 20 to 30 minutes. You can eat it hot from the oven if you really, really can’t wait but you may burn your tongue! 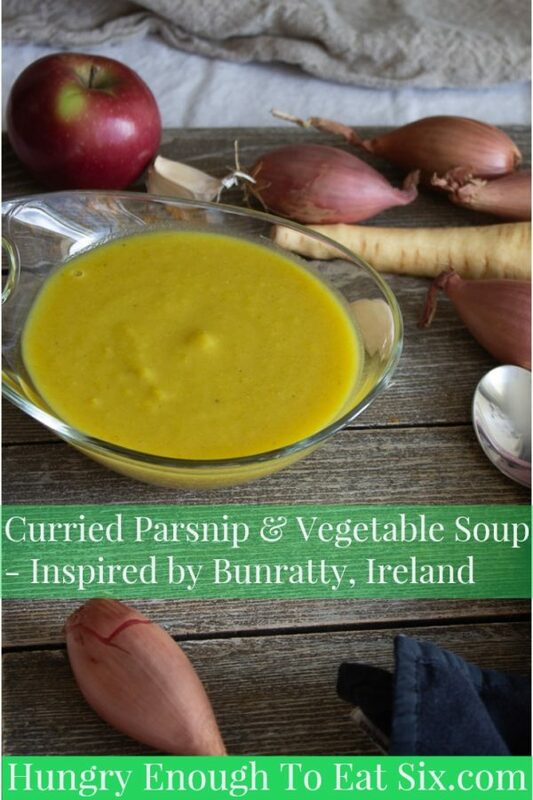 Also, letting it rest will give the juices a little time to set so that the servings are less runny. 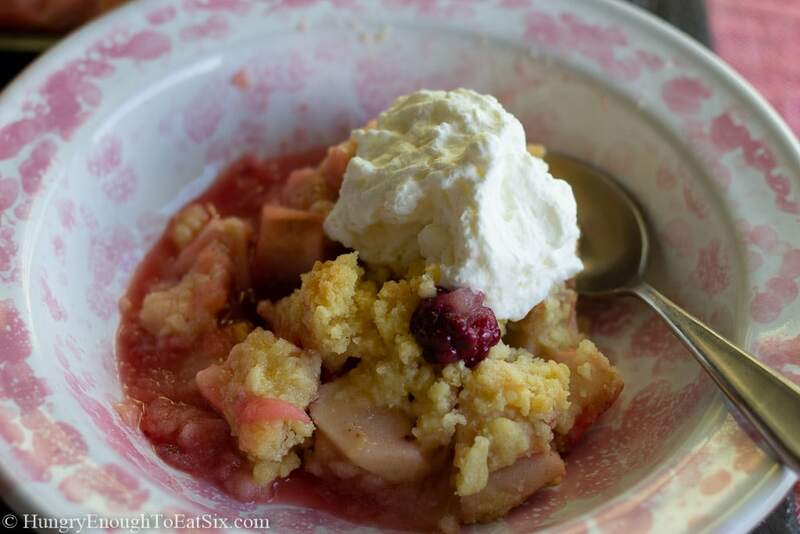 Serve portions of the Apple-Blackberry Crumble topped with fresh whipped cream. Leftover crumble can be covered and stored in the fridge for up to 3 days. 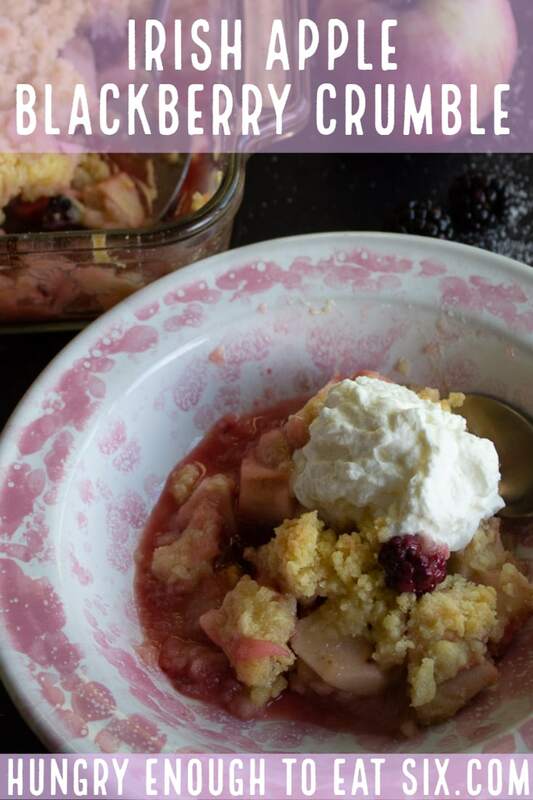 Have you tried this Irresistible Apple Blackberry Crumble? 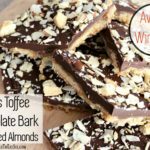 Please click the stars at the top of the recipe to rate it and leave a comment for me below! 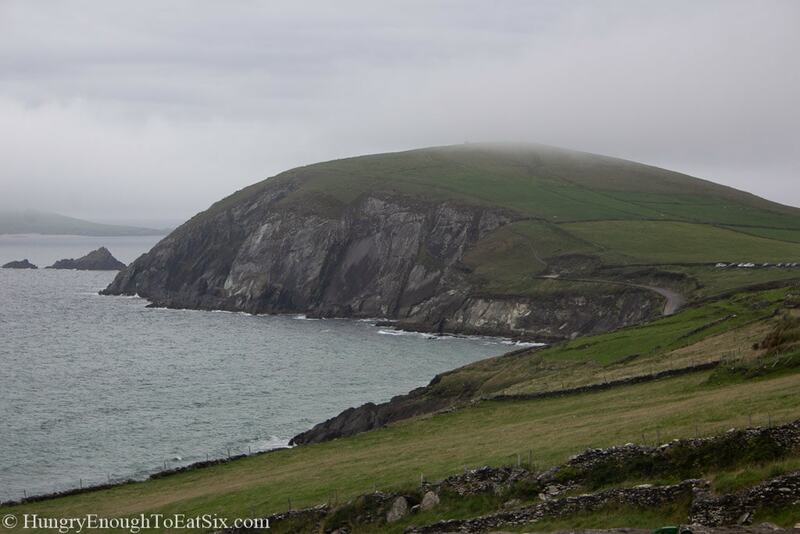 I think this is my favorite post yet, from the beautiful B&B and scenery in Dingle to the adorable baby lamb. 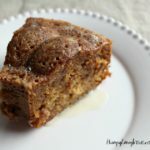 Also, this recipe looks delicious and I pinned it!